A weekend alone on the hills. Allison was away seeing her dad and stuff, so it left me free rein to do whatever I fancied. Obviously not Corbetts, nor Grahams, but anything else was fair game. 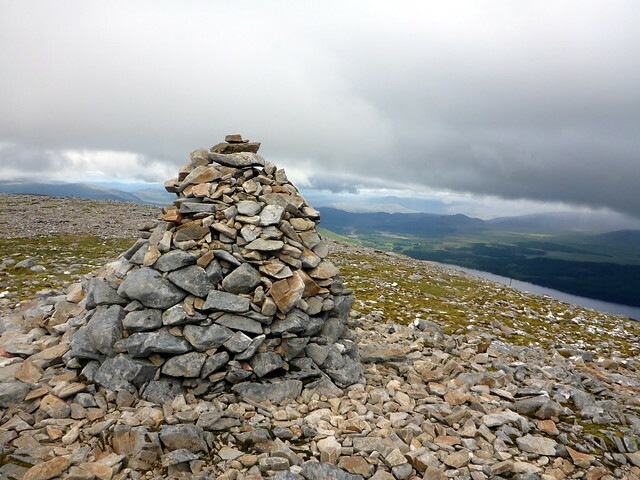 My Munro Tops are in need of a little attention - last week's abortive attempts to get a couple at Corrour were scuppered by the train drivers' strike. I have some clusters - like a dozen around the Mullardoch Hills, some on Skye etc and some isolated singletons that require mopping up. 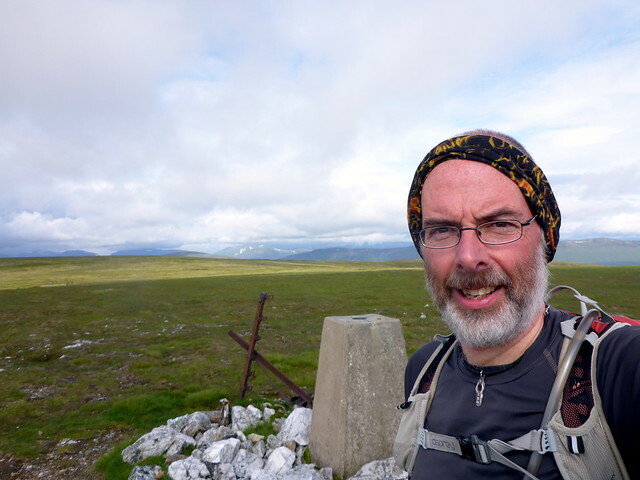 I also had the opportunity to test myself for fitness, particularly in respect of ascent - doing Corbetts mostly means it's now uncommon to have a day with 2000m ascent. I'm planning a circuit of the Mullardochs and Tops for next month, which is a scary 85km and 6700m ascent, so I wanted to have an idea of how I'd fare. 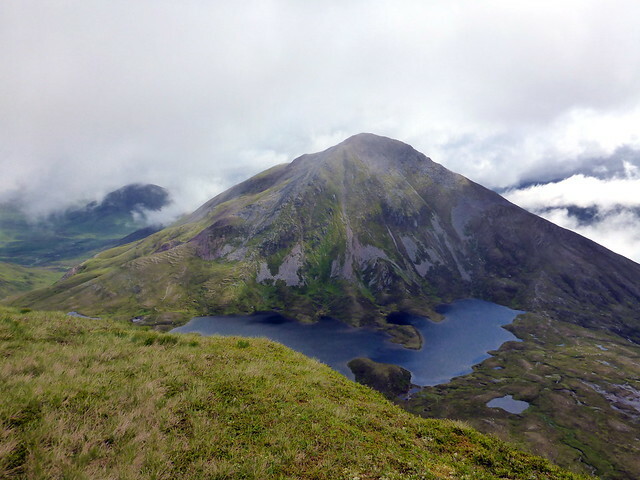 My plan was to do Airgiod Bheinn on the Beinn a'Ghlo hills starting on Friday night and finishing off on Saturday, then Glas Mheall Mhor, a top on A'Bhuidhenach Beag on the Saturday afternoon and Stob Dubh, an outlier of Carn Liath on the Creag Megaidh hills on the Sunday. The forecast was pants and I didn't feel particularly enthusiastic about the weekend before I went. I'd wanted to try out my new 1 person Enan tent but even that was in doubt - I reckoned I'd get as far as the flat area after the summit of Braigh Coire Chruinn Bhalgain or maybe the bealach with Carn nan Gabhar on Beinn a'Ghlo on Friday night, and the winds were forecasted at 50mph - I wasn't happy about camping in that at 1000m in a tent I'd not used before. So in went the Nammatj - three times heavier but at least up for the job of withstanding storms if needed. I got away from work mid-afternoon and had a slow drive up to Blair Atholl with a couple of accidents slowing traffic up on the M9. At least the T in the Park traffic was already past. Arrived at Loch Moraig just before 6pm and got saddled up. 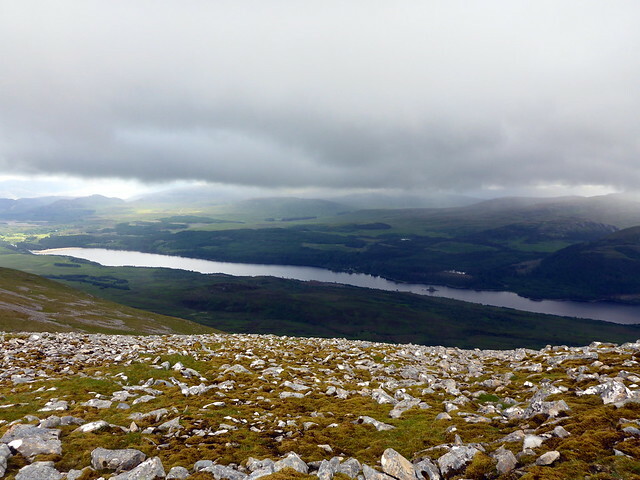 It was quite windy and the clag was down to about 600m but at least it wasn't raining. 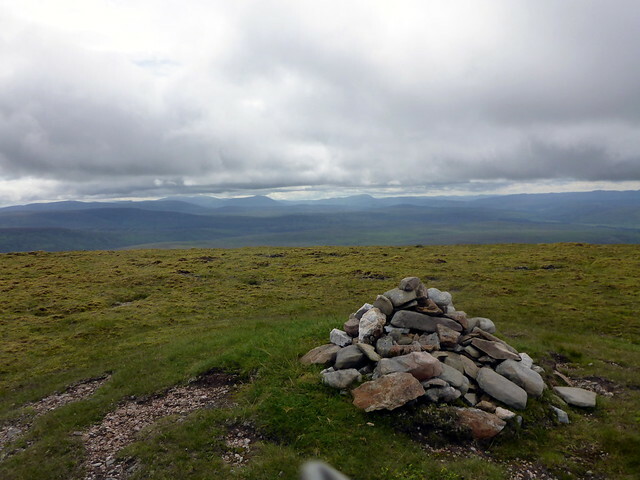 And the wind kept the midges away Took just over an hour to reach the top of Carn Liath. 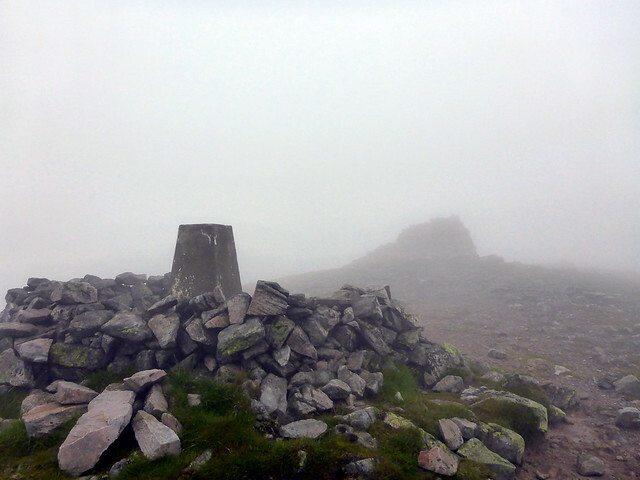 As I walked over Beinn Mhaol I got occasional views through swirling mist to the Tilt and the hills beyond. But mostly it was milky white air. 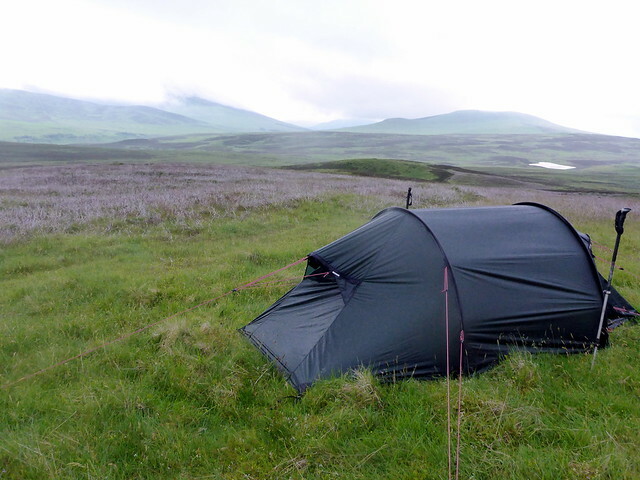 I was enjoying the utter quiet of the evening - no one was around, I could stop and pitch the tent whenever I liked (on a suitable surface anyway). I reflected on the fact that these hills had been the last hill-walk with my dog, back in February 13, just a few weeks before he died. He'd been poorly that day, though I had no idea there was anything seriously wrong with him then, slipping and sliding on icy snow. I dropped down to the bealach with BCCB and up to its summit - just as the map suggested I could have pitched here, although the surface was quite stony and the pegs would have been sitting in moss. 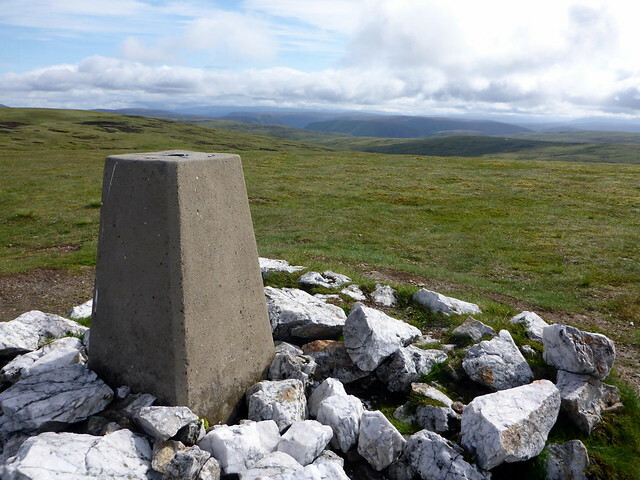 i got glimpses down to the bealach with Carn nan Gabhar which looked possible too - I decided that dropping a couple of hundred metres would probably be good if the wind kept up. Walking over the spongy grass on the bealach I did identify a semi-suitable pitch spot, with some shelter from the wind, though flatness was hard to come by. 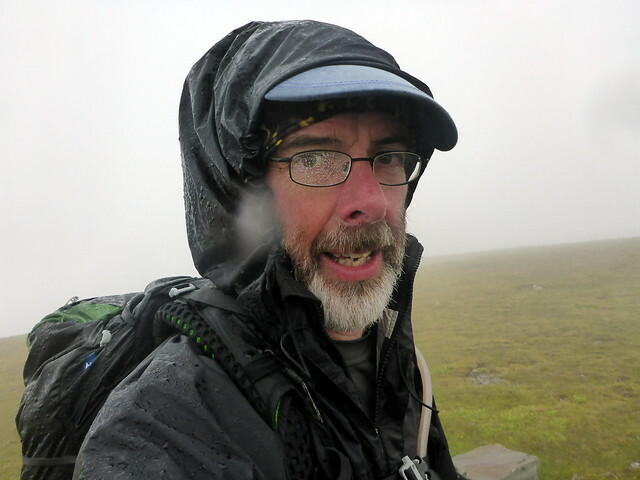 I considered pitching then going up and doing Carn nan Gabhar & Airgiod unladen and descending down by the Allt Bealach an Fhiodha in the morning. However, it wasn't even 9pm yet, light was reasonable and I decided I'd just go and do the summits and try to get down and off the hill, pitching somewhere in Coire Lagain before it got too dark. i followed the diagonal path up to Carn nan Gabhar - much easier than going straight up, which I remember doing in crampons before. 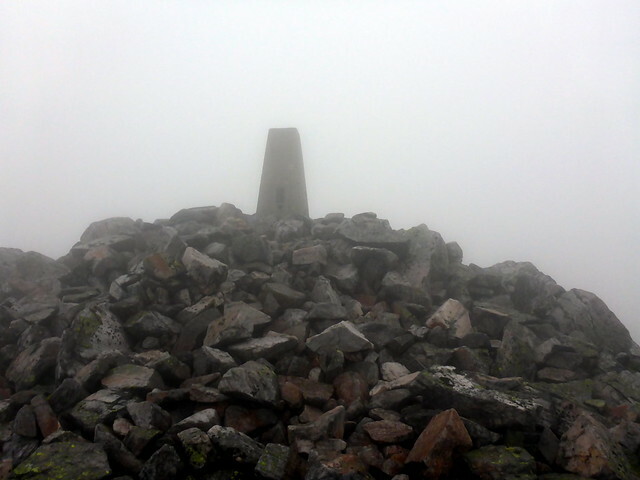 Up to the trig then the cairn beyond, bit slippy on wet boulders. 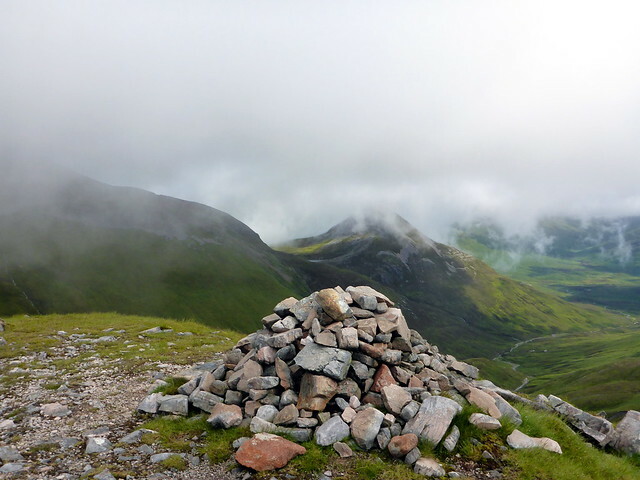 Retraced my steps along the top of Gabhar and followed the flattish grass to Airgiod Bheinn - a rocky cairn marking the Top. I wasn't sure how easy it would be to descend in the dusk, but there's a good path which was easy to follow most of the time. I reckon many people doing these hills descend this way given how well used it looked. One short section of loose scree, otherwise fine. 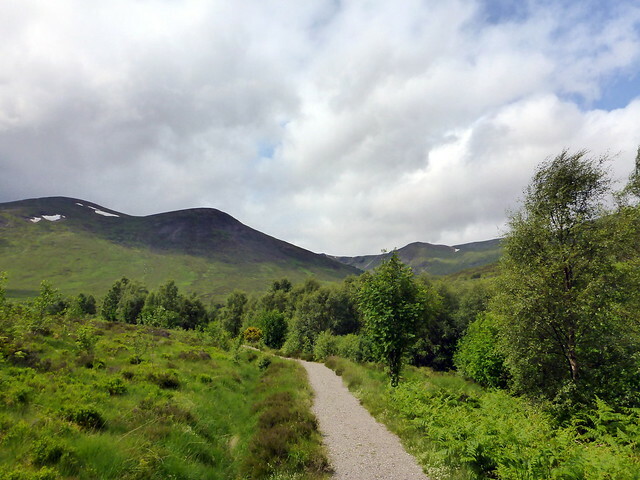 The path was taking me further south than I'd intended to go - I had planned to head over Beinn Bheag and return to the outward path that way, but I wasn't doing that now. I got across the Allt na Beinne Bige and followed a boggy trail. As the light faded it was hard to see how deep the bogwater pools were - I ended up going into one up to my hip. Good news was I had my waterproof trousers on (bad news was that the side vent zips were almost fully open ) I decided I wasn't going much further and scanned around for a suitable pitching spot which I found at 11pm. By this time the wind had completely dropped and I could easily have used the Enan, saving 2.5kg into the bargain, but there you go - I was equipped for the worst. A lovely peaceful night, occasional birdsong and some overnight rain. Up at 6.30 and on my way by 7 - only a matter of 30 mins or so back to the car from my pitch. 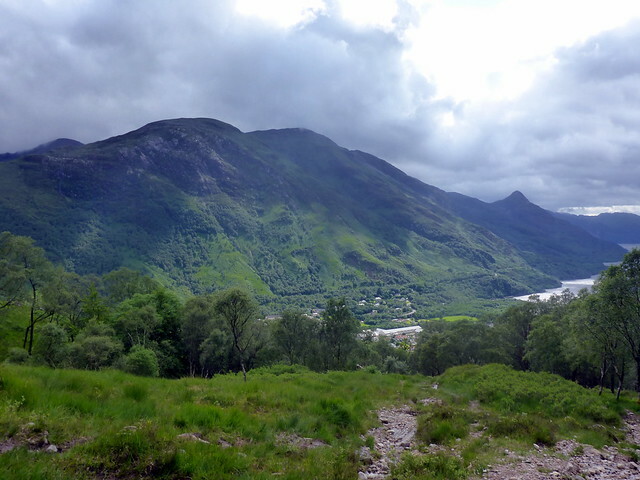 Met a guy setting off to do the Beinn a'Ghlo 3 then crossing over the Tilt to do Carn a'Chlamain - a nice route if he could manage across the river. Drove up the A9 towards Dalwhinnie and pulled up in a layby to start the walk. 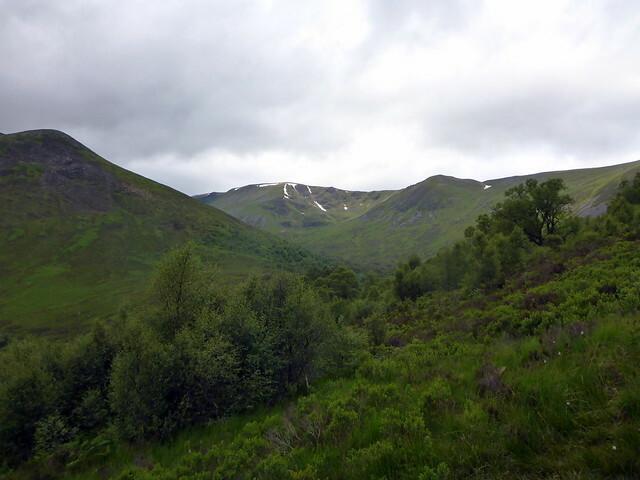 I wasn't really sure what route I was going to use and ended up following a fence line to the west of the Allt a'Chaorainn before deciding it would be easier to make for Fuar Monadh and head for A'Bhuidheanach Bheag from there - a hill that was no use to me as I'd already climbed it and its buddy Carn na Cam twice - in poor vis/ snow on each occasion. So it was quite pleasant today to at least get some views of the landscape I was crossing. 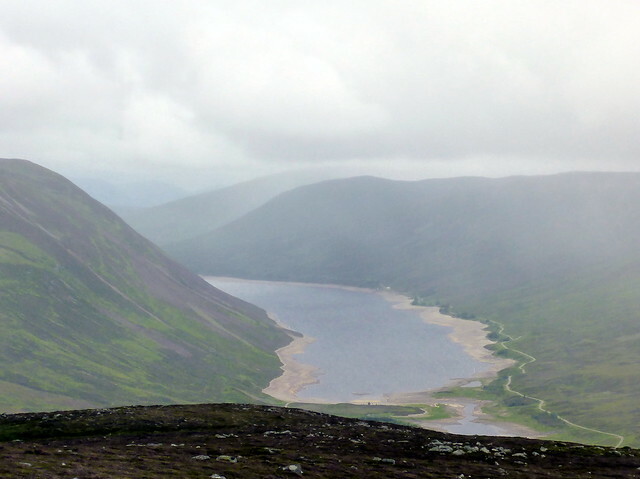 There were views of teh Dalwhinnie 4 and to Loch Ericht. 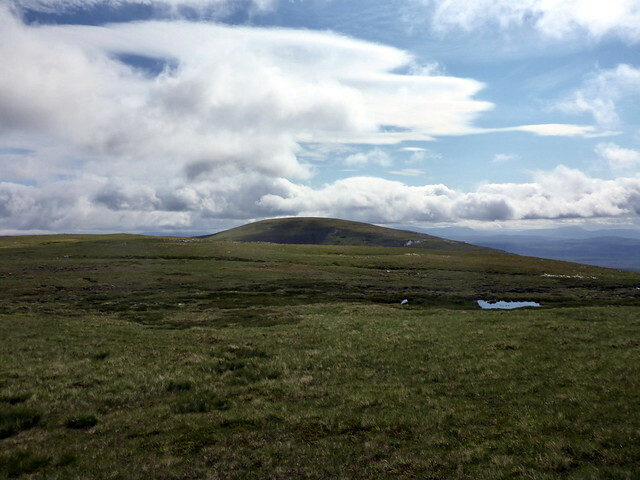 As I came to the plateau on Fuar Monadh I could just make out the trig point on ABB in the distance and set off for it. Easy going, pleasant underfoot, some wild flowers poking through the short heather. 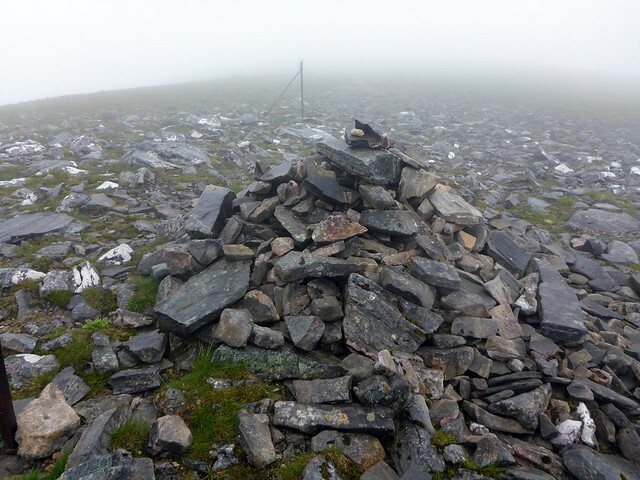 Made the trig then set off for Glas Mheall Mhor, which looked both furtehr away and bigger than I'd been expecting - I rather assumed it would be a mere bump in the ground given its parent hill, but it looked like it would cost some ascent. 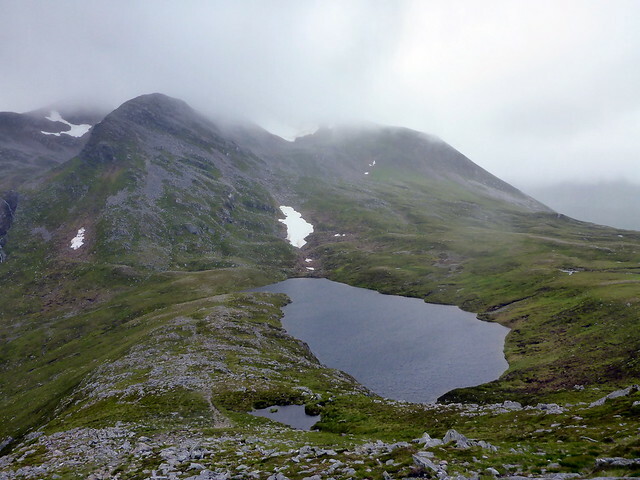 There was a boggy bealach to cross then over to the hill itself. To be honest the ascent wasn't much. 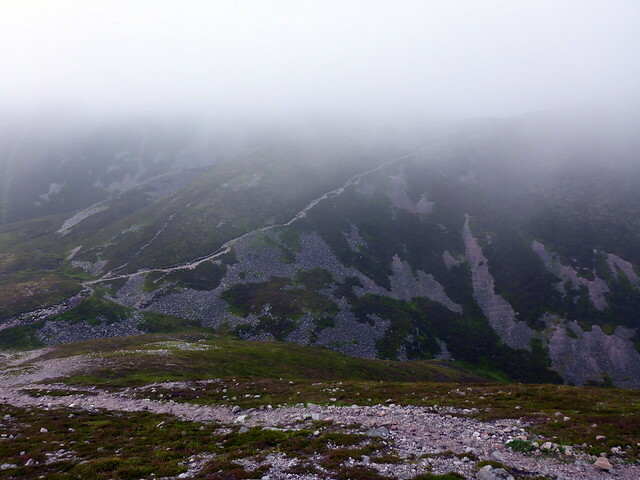 I'd originally planned to return by the outward route, although I generally dislike doing that, but I decided I'd head down over Glas Mheall Beag and Druim Coire Mhic-Sith to the Military road and follow that back to the car. 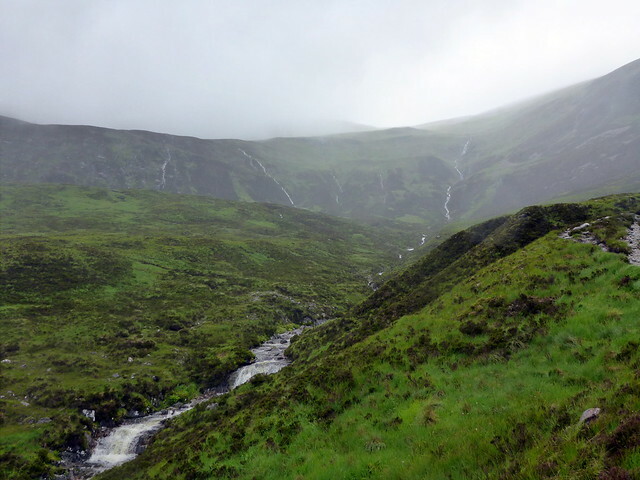 No particular problems encountered, although the Allt Coire Mhic-Sith is in a bit of a gully and it's easier to cross near the A9. Easy walking up the Military road, which is now used for the powerlines. I never feel comfortable walking under these electric pylons, expecting my brain to be scrambled I think. Back at the car for 12.30 and the thought occurred to me that I could get some of the Creag Megaidh circuit done today and get another Top in on Sunday. Hmmm. Drove across to Aberarder and parked up in a quite busy car park at Creag Meagaidh. 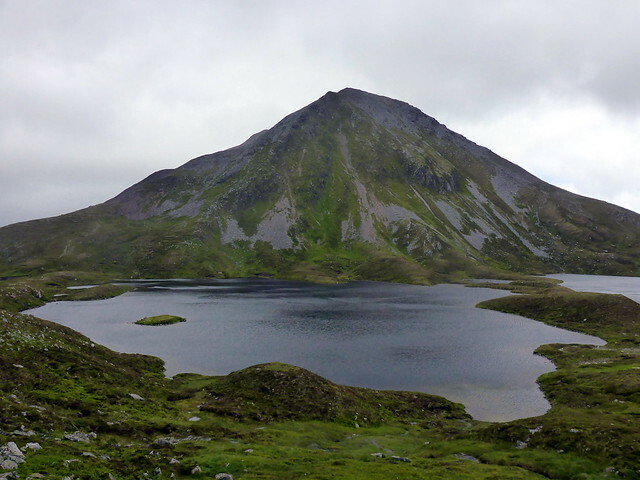 I had plans to climb Carn Liath and Stob Poite Coire Ardair along with Stob Dubh as this would bring my Munro count up to 100 - I'd already been up Creag Meagaidh twice when doing the other Tops around it. Set off in sunshine at 2pm with my big pack on. I wanted the option of pitching up on the hill if I chose - or felt tired - but knew I should be able to be back at the car before it got dark. This time I did put the Enan in which was a much more pleasing 1.1kg. 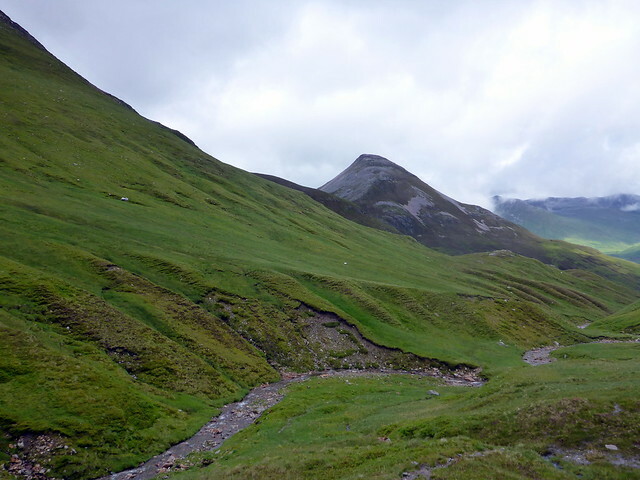 Headed up the standard track to Carn Liath which was resembling a small river in its lower sections. Met one guy coming down who'd been out to do the Top I was heading for. He reckoned the weather would be coming in about 4 o'clock (turned out fairly accurate). 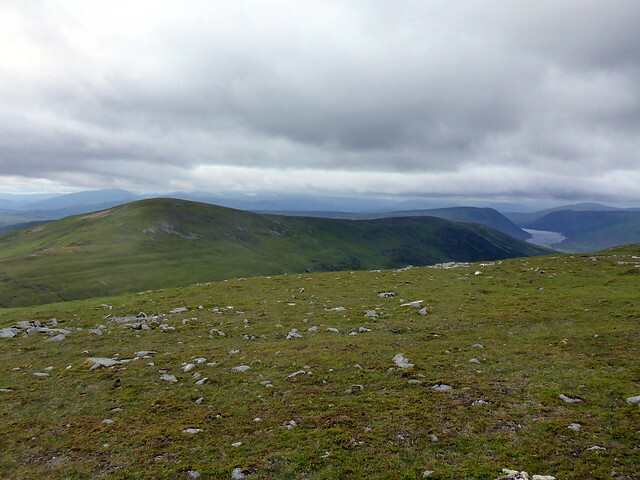 I could see the clouds gathering over Loch Laggan to the South. 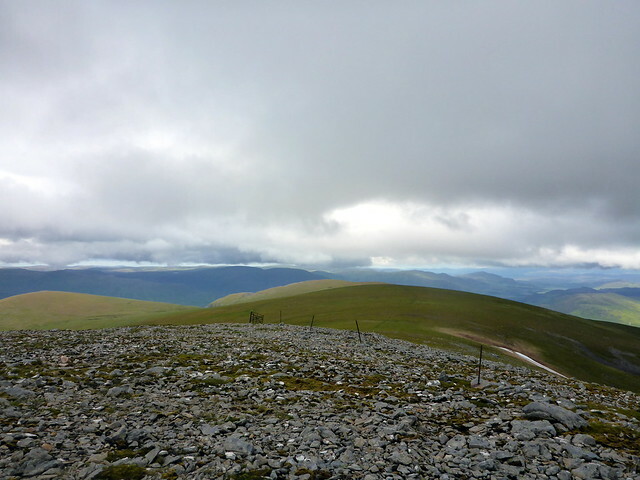 I pressed on, up to the boulderfield at the top of Carn Liath. From there I could see the hills rolling away to the east, over A'Bhuidhenach with Stob Dubh at the end - looked about 2km each way. I had planned to add in Meall a'Chaorainn Mhor but omitted this Sim on the basis that it would cost me time and limit my opportunities on Sunday. 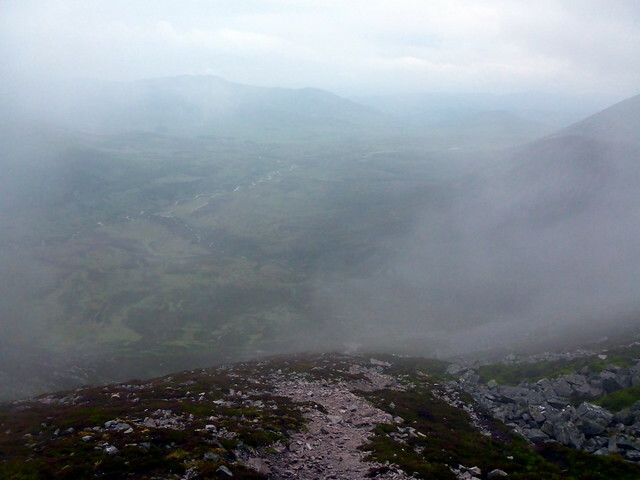 Just as promised the rain/clag started at ten minutes to four as I was gettingto Stob Dubh. 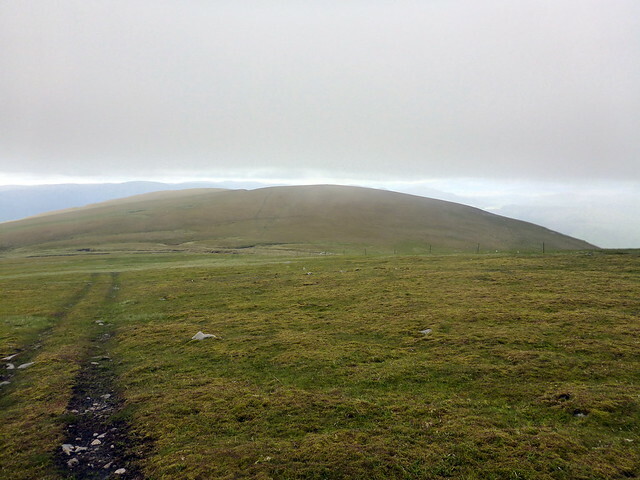 The clag was down from then on and the wind picked up too, making the return journey to Carn Liath much less pleasant than the outward one. At least there were ATV tracks to follow. I made it back to the parking spot at 8pm, having detoured to a patch of wild flowers just before the parkign area - wow the fragrances there have to be smelled to be believed. Stronlossit it would be - got there about 8.20 and was delighted to hear they serve food til about 10pm. Fish and chips and a pint were very welcome, then I went over the road to the campsite. It was different to be in a busy campsite compared to the quiet of the hills, but I just wanted to get my head down. The midges were out in style tonight as I had a bedtime coffee in the tent porch before turning in. I'd forgotten my book (Edmund Blundell - Undertones of War) so had a wee whisky without reading matter and hit the sack. Didn't take me long to get over It rained heavily through the night - at least that kept the campsite noise down. Bright sky at 6am - unfortunately this didn't last and as I was setting off at 7am the clag was down and the smirr was on. Roads nice and quiet down to Kinlochleven - parked up at the church and was ready to go by 8. 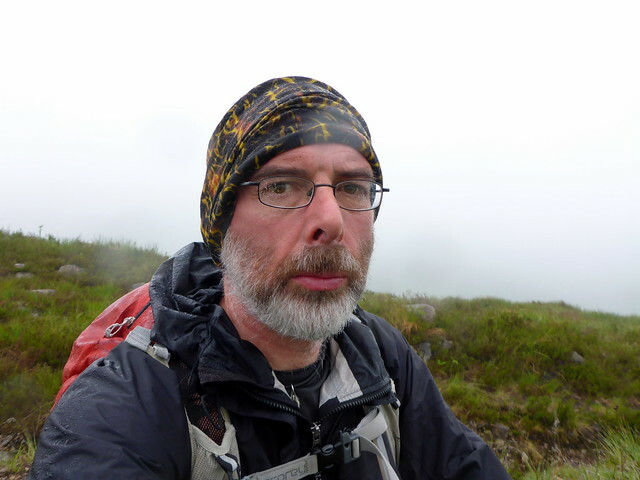 Feeling a bit sore and tired as I set off and the claggy wet morning didn't really help. It feels like a long way up the An Cumhann and I found myself stopping for a chocolate bar only half an hour after starting. 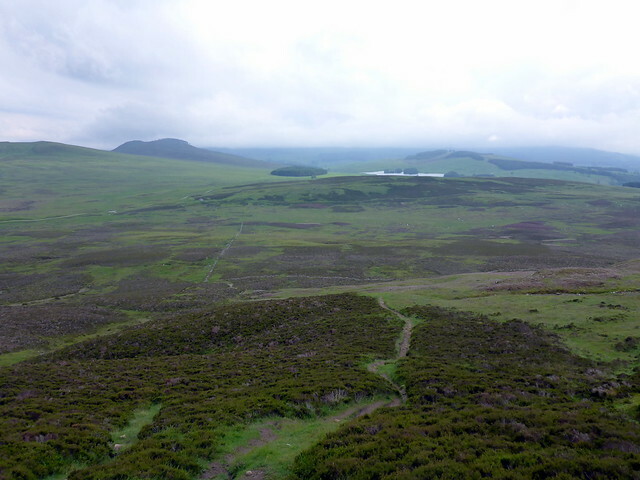 I needed time to plan my route too - I reckoned if I did Na Gruageichean first that would leave my options open - I could come off the hill to the west, although I did that previously and remembered it as a hideous descent over slippy wet grass. I could go on to Binnien Mor, or I could do the set of 4 and include Binnien Beag and Sgurr Eilde Mor. From the outset this was what I wanted to do - anything else would have been a let down. 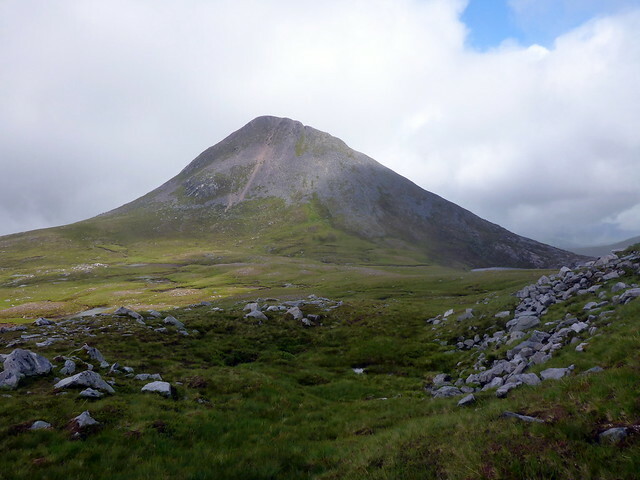 First time I did these hills I had hoped to do all 4 but it was full winter conditions and the route up Binnien Mor from Beag was -let's say unfavourable. 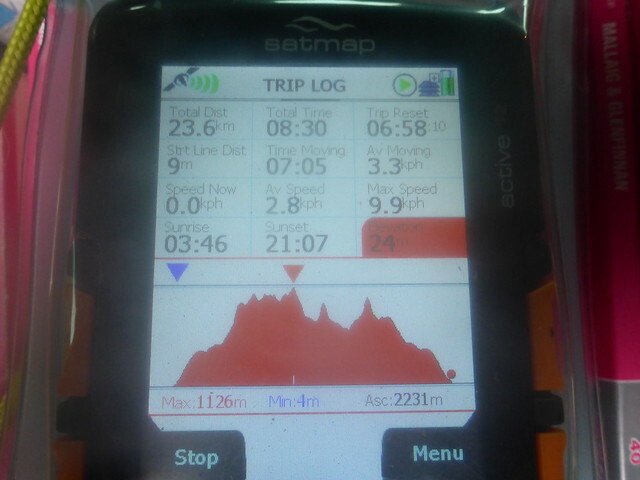 I was irked by one of my companions that day declining to go for it and ended up doing the 4 hills over 2 days. This was an opportunity to get all four without snow being involved. Firstly I had to get up Na Gruageichean - I decided to cut up the south side of Sgurr Eilde Beag from the path at about 700m. This was very steep and stony in places, but got the lungs working. 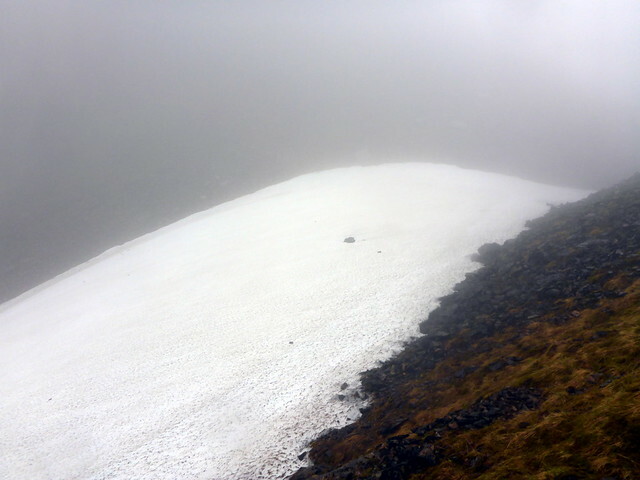 Over the summit of Eilde Beag then up to the 1062m point. 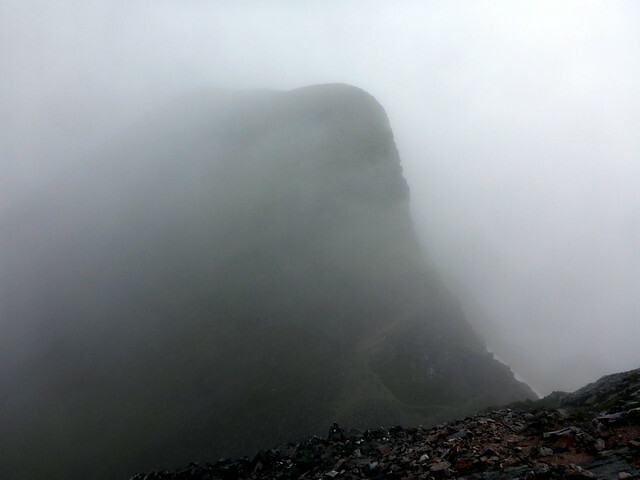 I was quite miserable up til then, but the sight of a ridge to go along - even in clag - cheered me up no end. Last time round this was a tricky venture with cornicing and big slides down frozen snow, but today it was just a bit of fun. 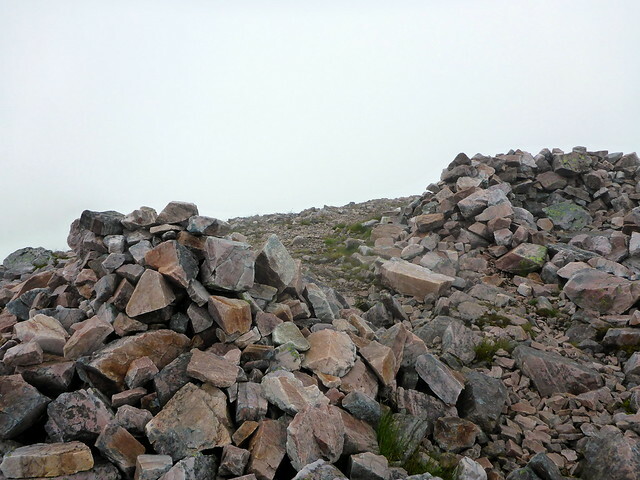 I kept to the crest most of the way and pulled myself up over the boulder field to the 1056m cairn. Now to find the other Top. 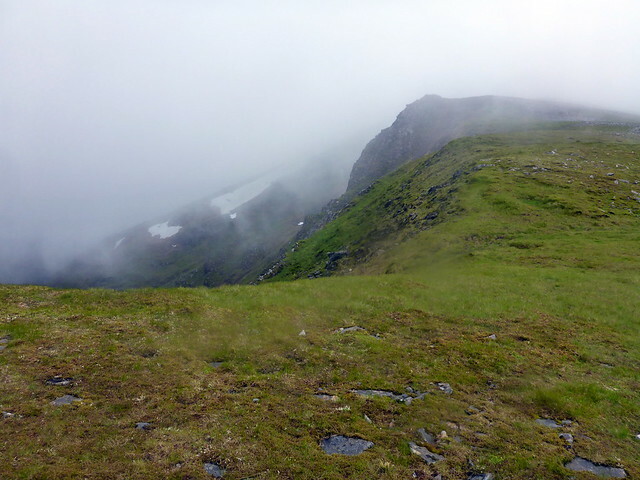 I could see nothing in the clag, but did spy a path wending NW which I guessed would take me where I wanted to go. 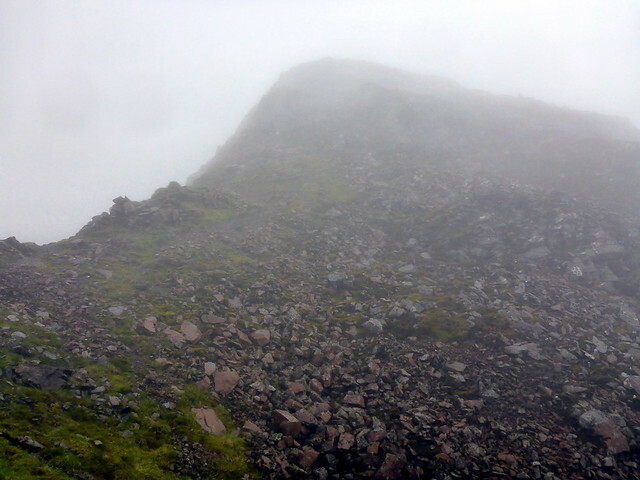 Boulders, descent to a rocky/scree bealach and the NW Top looming out of the mist at me. A little scramble up a scree chute then onto grassy slopes to the sunnit of the Top - yay! number 4 Top of the weekend. 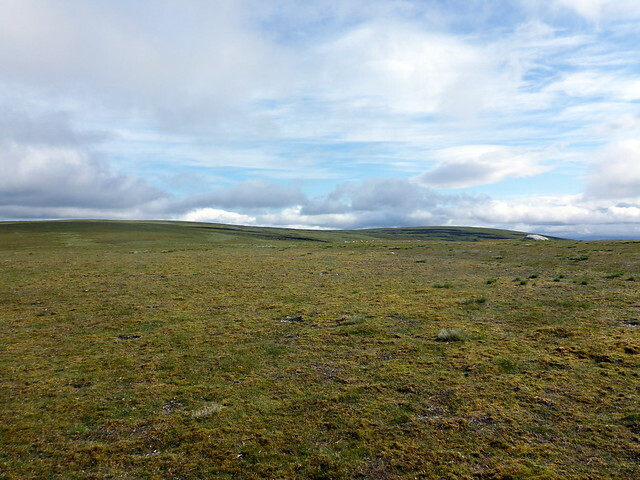 I returned to the main summit - there is a profusion of paths leading there - and followed the ridge back to the 1062m spot. I was feeling tired now, cold with the wind and rain. I stopped for an early lunch, putting on my softshell under my waterproof and enjoying a hot cup of coffee. 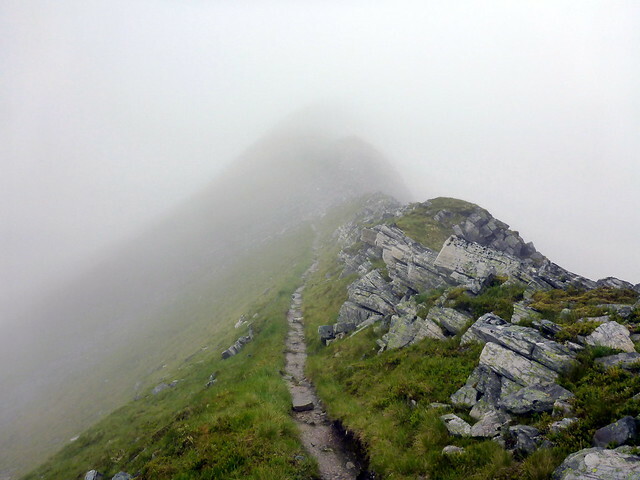 Then onto the ridge leading to Binnien Mor. I remembered this as being easy, even in snow, and so it was. 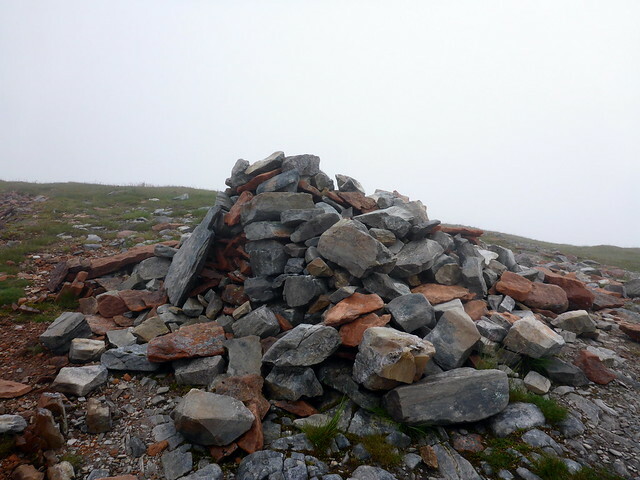 The summit cairn was being pelted with rain, so I didn't linger. 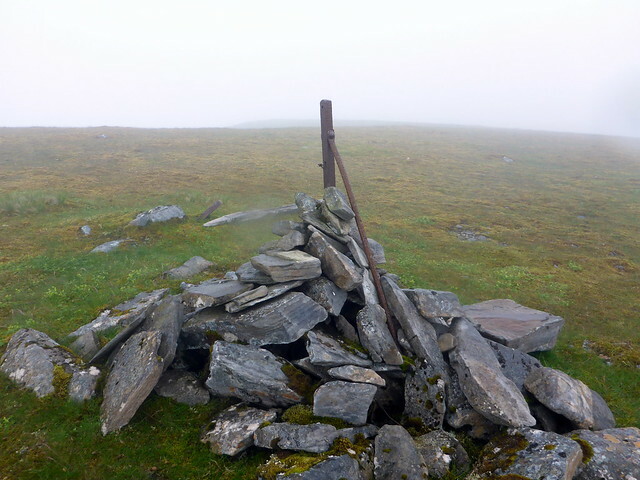 I did wonder how to get down from here - I assumed there would be a path, but it was too claggy to see much. 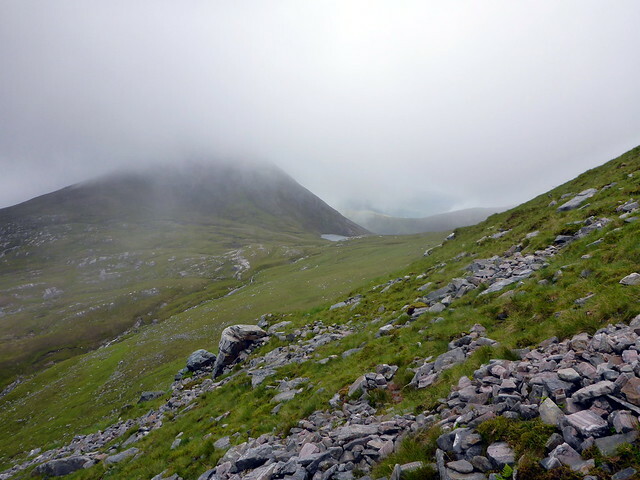 i did pick up a trail going off the North of the mountain, when I wanted to go East towards Binnien Beag. it was far too rocky looking to pick about for another path, so I decided to follow this one down towards Gualainn a Bhinnien Mhoir then cut round towards the lochan by Binnien Beag when I got the chance. It was slippy underfoot and I fell a couple of times on the descent. 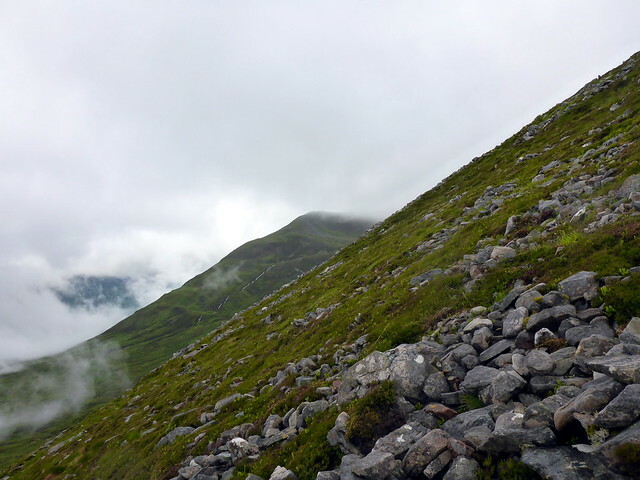 I made my way round towards the path leadign to Binnine Beag - which was looking particularly steep from this angle, with one scree run coming straight down from the summit. 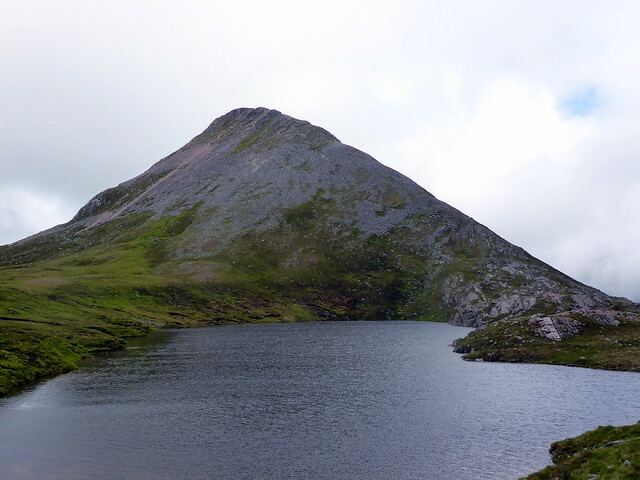 I got to the lochan, picked up the path and made my way easily up the rocky track to the summit. 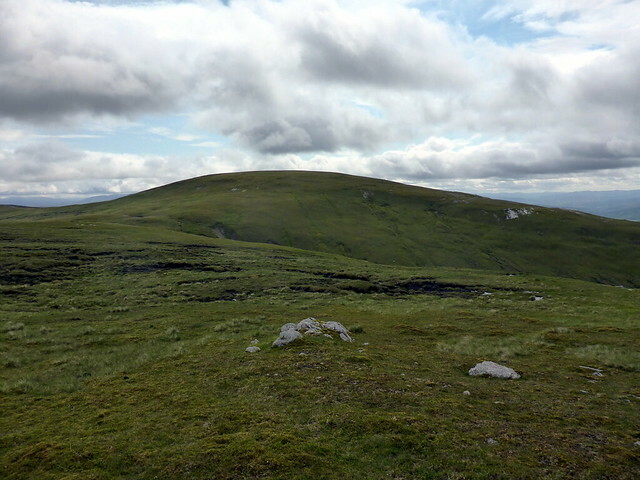 i could see two other groups of walkers making their way towards the hill as I reached the top. Descending by one of the many routes off the hill I joined the path again, looking with some distaste at the ascent required to get - first of all - to Coire an Lochain and then up to the top of Eilde Mor. However, the zigzag track does most of the work for you as it heads up from the river crossing. Last time was another straight up in snow, so this was unexpectedly easy. 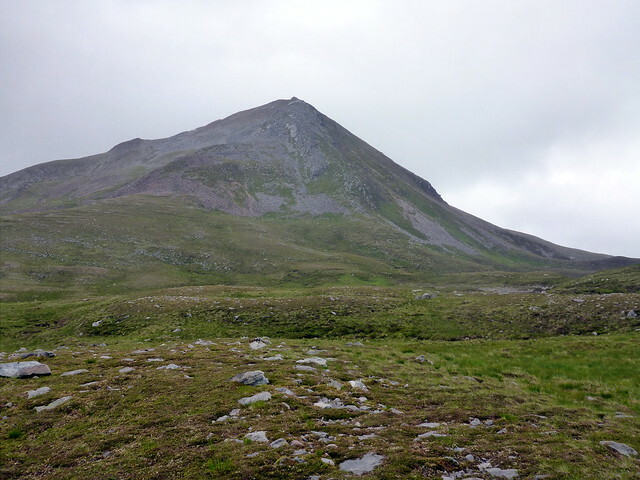 As was the ascent of Sgurr Eilde Mor - the track up making mincemeat of the ascent til the last 100m or so which are over loose scree and are quite steep. 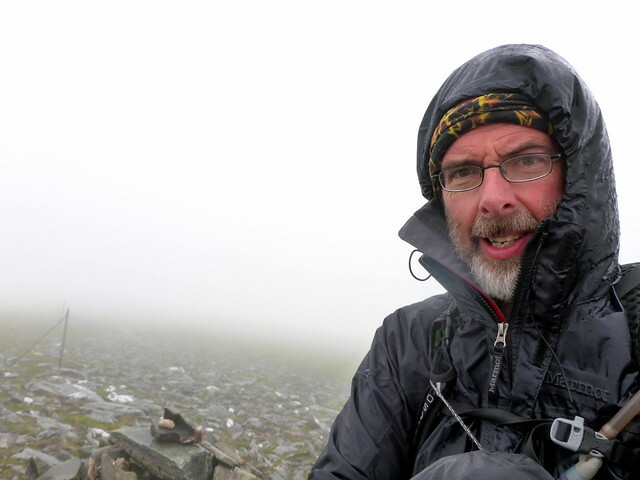 Delighted to have nailed the 4th Munro of the day I looked around for the best way down. It all looked a bit steep and rocky on the SE shoulder, so I decided I'd probably be quicker - and safer - re-tracing my steps down the fine ascent path. Definately quicker - I was at the bottom in no time and back on the track that runs to the east of Eilde Beag then back the way I'd come. 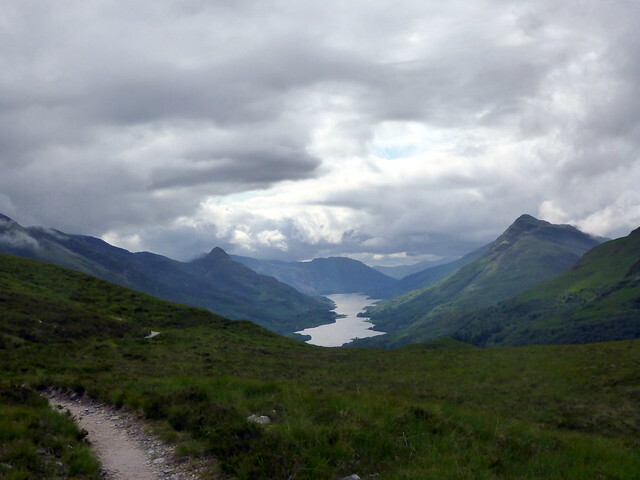 Clouds were lifting over Loch Leven as I made the long descent and the sun even graced us with a few beams. Back at the car in eight and a half hours, a little footsore but happy with my efforts. Rather a lot in a weekend there, WM. 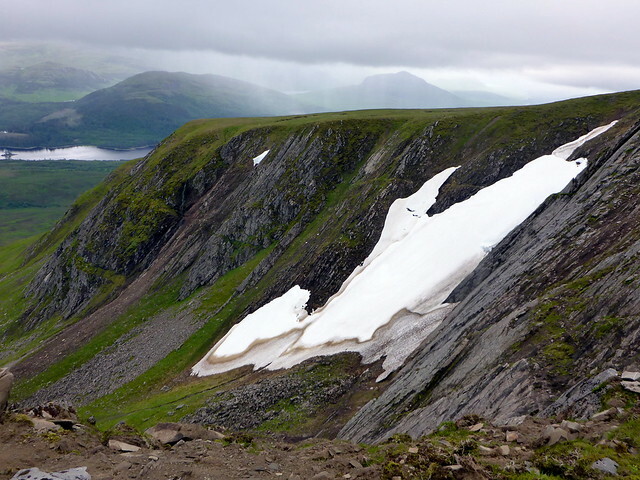 Nice improvisation to get from Binnein Mor to Binnein Beag in those conditions. The direct route the other way was fine with clear weather when I did it. It might have been tricky coming down that way from BM in the clag. Good stuff, a full weekend! 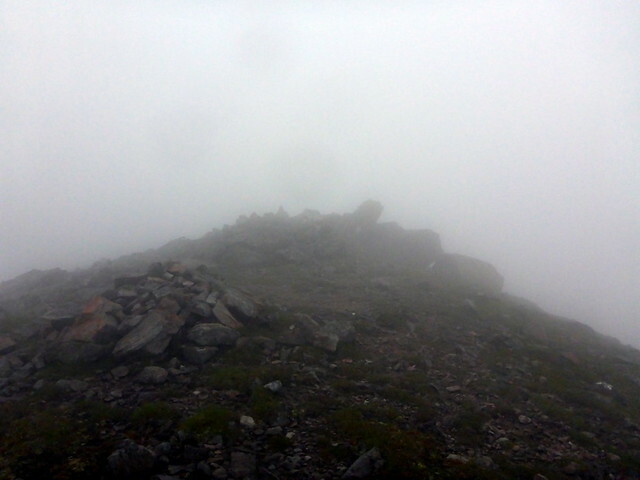 I remember those summit views from Beinn a'Ghlo all too well - and the bog - though fortunately not such a deep encounter. And I'm not fond of walking under electric lines/pylons either, especially in humid conditions when they feel about to turn into a giant fly-zapper. 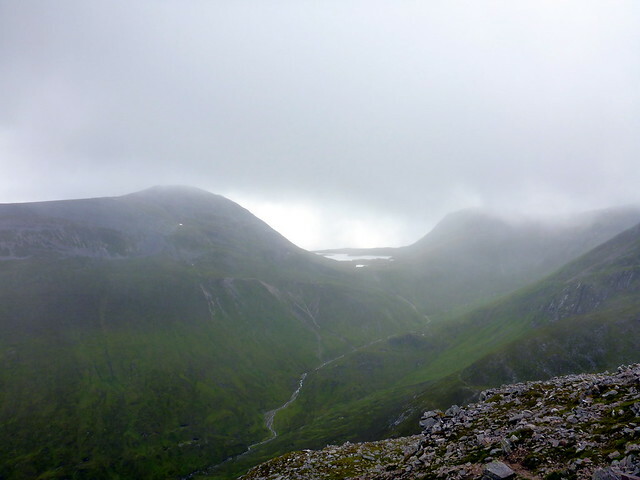 When missing not one but two tops of the Creag Meaggaidh group, I managed to omit the 2 furthest apart . And beautiful weather for my previous visit here means that it will be done in clag and rain, to keep my weather karma balanced. Finally, thanks for figuring the distance and ascent for the "Mullardochs and Tops". I'm attempting to include Munro Tops as I go, so some sobering numbers like that are helpful in making me see sense (or turn my wildest ambitions towards other hills first). 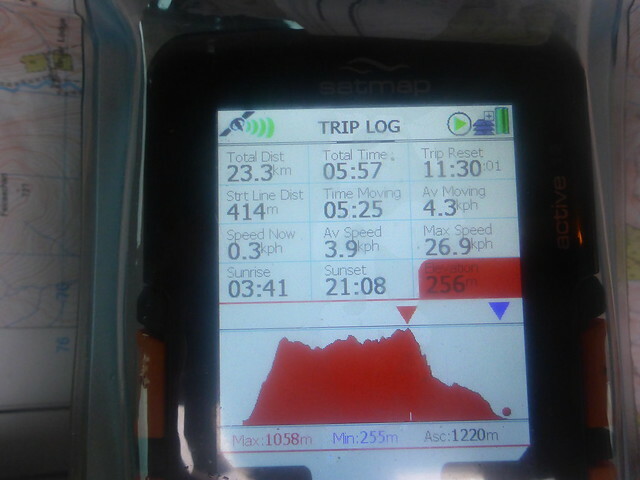 Finally, thanks for figuring the distance and ascent for the "Mullardochs and Tops". 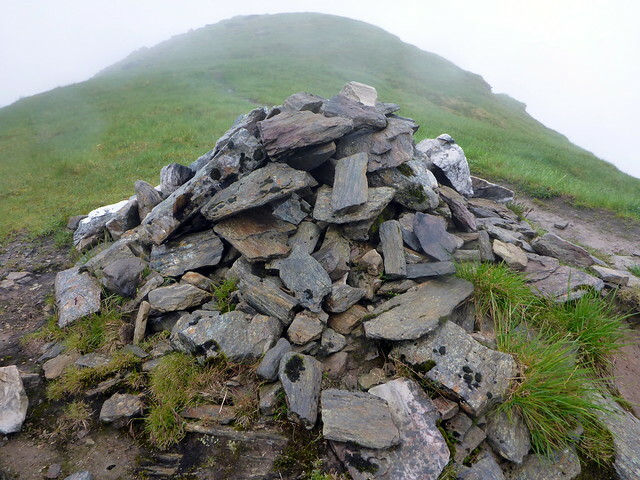 I'm attempting to include Munro Tops as I go, so some sobering numbers like that are helpfu. l in making me see sense (or turn my wildest ambitions towards other hills first). 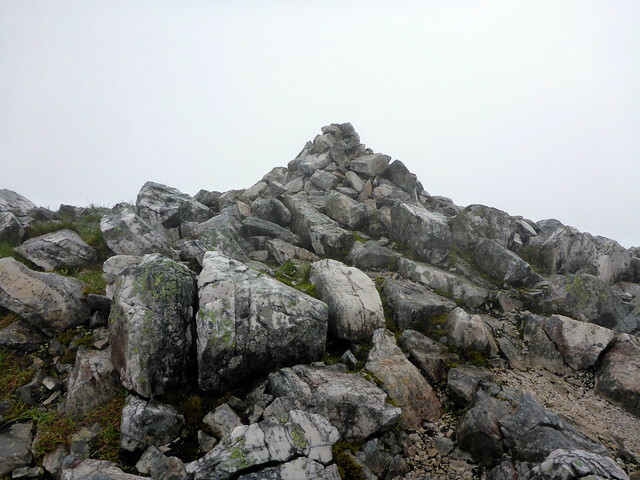 i was stupid enough to decide to do Tops when I was almost finished my round - I blame Bill Strachan from Scotch on the Rocks guiding for taking me up the Bhasteir Tooth (the easy way) and suddenly making Tops a possibility. 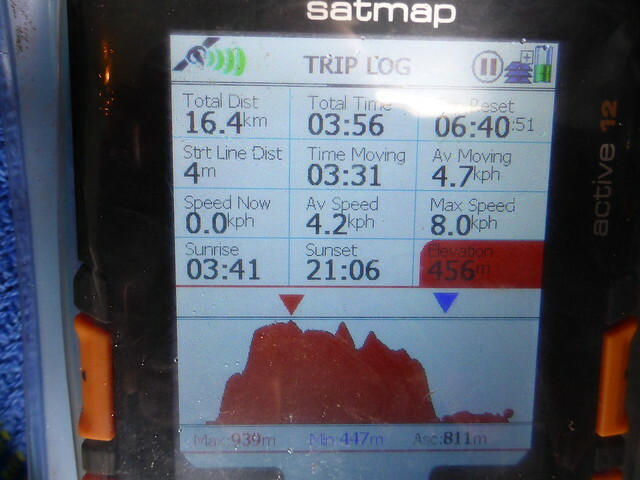 After I'd done something like 250 Munros (though inevitably I'd done a number along the way by default). But it's a good excuse to go back over some hills by different routes. As for the Mullardochs, I came up with this route. Don't like the return over Mullach nan Dheiragain but don't think there's an easier/more efficient way. 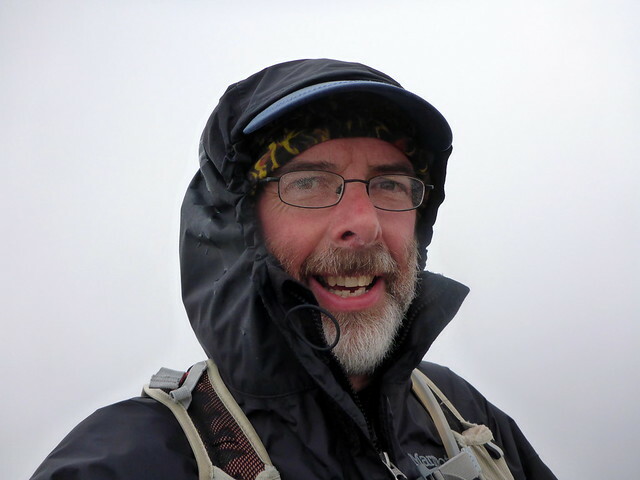 weaselmaster wrote: i was stupid enough to decide to do Tops when I was almost finished my round - I blame Bill Strachan from Scotch on the Rocks guiding for taking me up the Bhasteir Tooth (the easy way) and suddenly making Tops a possibility. 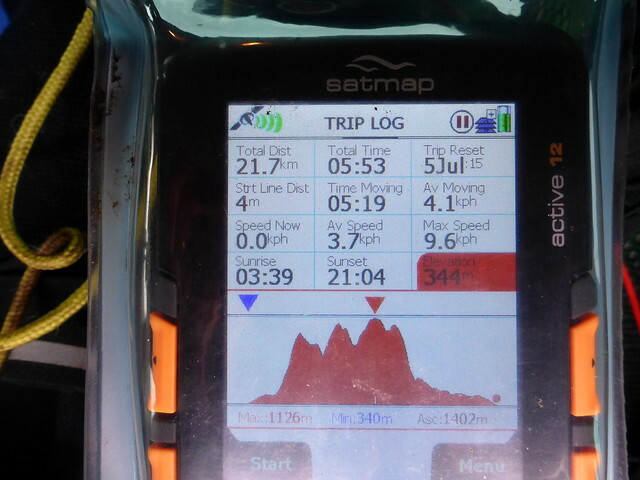 After I'd done something like 250 Munros (though inevitably I'd done a number along the way by default). But it's a good excuse to go back over some hills by different routes. 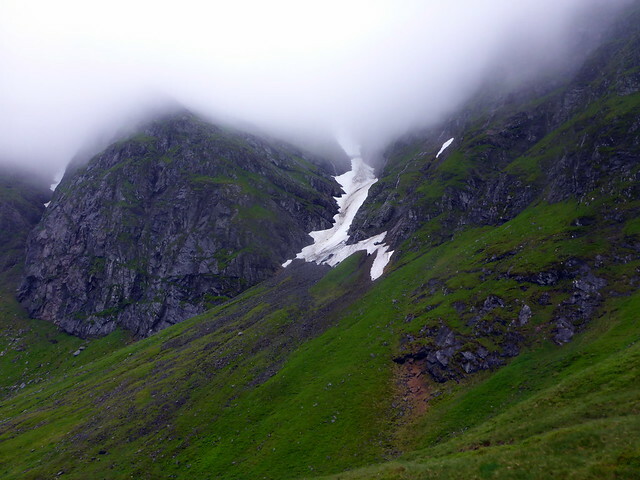 In my own (very idle and brief) wondering about the Mullardochs, the north ridge of Mullach Sithidh (the top beyond Mullach na Dheiragain) looked a possible ascent, though I've not even gone into comparing the numbers, let alone checking elsewhere than on paper. 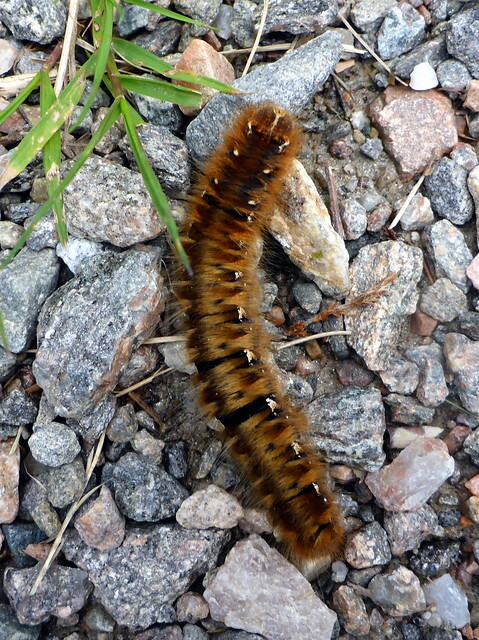 I wish you luck for the expedition (and a lot of favourable weather) and look for your report with keen interest. Driftwood wrote: In my own (very idle and brief) wondering about the Mullardochs, the north ridge of Mullach Sithidh (the top beyond Mullach na Dheiragain) looked a possible ascent, though I've not even gone into comparing the numbers, let alone checking elsewhere than on paper. You are Insane and incredibly dedicated. I admire you for that.